The Collab Blog: Summer Reading 2016 Kick-Off! Today we kicked off our Summer Reading 2016! A few months ago students voted on a theme--Overcoming Obstacles. The teacher Literacy Committee led by our API Megan Knight then went through various genres and selected several book options. 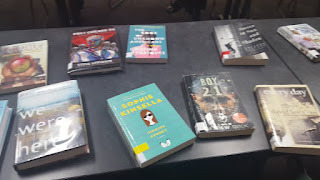 Students were invited either by various committees or randomly during lunch periods to do "speed dating" to help narrow down the choices to one or two from each genre. Ultimately, seven books were chosen. Literacy Committee members and students worked together to create promos for each of the books. Students then responded to a Google Form in order to select the book they would like to read this summer. Here are this year's promos! As you can see we tried to focus on "If you liked..." recommendations. This year we are happy to announce two new exciting updates to our summer reading program. First, each student at Elk Grove HS received a copy of the summer reading book of their choosing! Additionally, we are going to host our first Million Minutes of Reading in May. Each day in the month of May everyone in the building will "Stop, Drop, and Read." As we did last year, many teachers are "sponsoring" a book for their team or club this year. We hope to continue to build our committee of readers! Also like last year we had a kick-off event where teachers stopped by to pick up their book selection, enjoy some cake, and take some photo booth photos with the books they chose. Check out our tweets from the event at our hashtag #EGSR2016! What's the purpose of warm-ups?